Whether you’re planning a trip to Fort Lauderdale or you are a local who simply loves opera and great seafood, Riverwalk Arts & Entertainment (A&E) District’s “Pearl Fishers” promotion is certain to provide a delightful evening of culture. Wild Sea Oyster Bar & Grille. $50 voucher to Wild Sea Oyster Bar & Grille at the Riverside Hotel on East Las Olas Blvd., including guests’ choice of an oyster appetizer or red velvet beignets and complimentary valet parking (only at the Riverside Hotel). Advance dining reservations are required at 954-467-2555. Use the promo code OYSTER when calling Florida Grand Opera at 800-741-1010, Monday–Friday, 10 am–4 pm or when securely ordering online here. Promotion valid for either March 12th or 14th performances of The Pearl Fishers at the Broward Center. You must purchase two tickets for this offer to be valid. 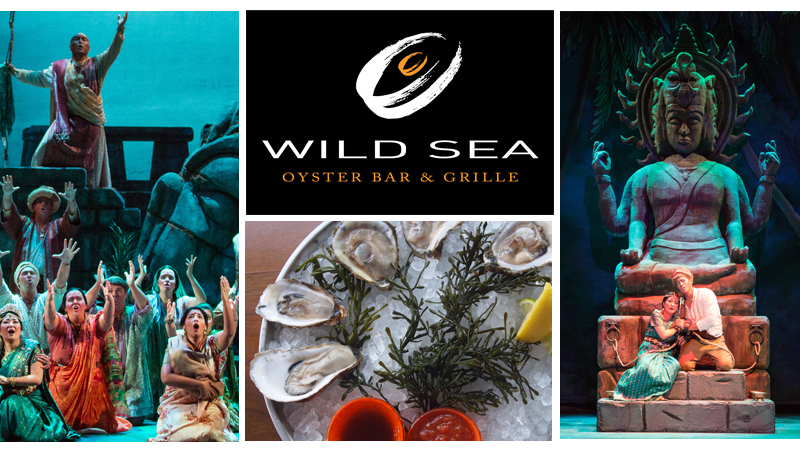 Reservations for seating at Wild Sea Oyster Bar & Grille must take place between 5–6 pm on March 12 or 14. Dive into the performance of The Pearl Fishers along with a delicious seafood dinner by clicking below and using the promo code OYSTER at check-out. The $50 off dinner and free dessert voucher will be sent prior to the performance. You must purchase two tickets for this offer to be valid. Guests will be responsible for paying the balance of their meal should it exceed the $50 covered by the voucher along with any taxes or gratuities. Advance reservations are required and the offer cannot be used on previously purchased tickets. Only one $50 voucher per household. While supplies last.